It can be really devastating to lose contacts on your iPhone 7 (plus), which makes it difficult for you to communicate with friends, family or even colleagues at work. To ensure that you always reach your iPhone contacts no matter what happens, you need to save them somewhere else. The best option you can think of is transferring your contacts from your iPhone 7(plus) to computer. This will save you the doubt of completely losing your contacts whenever something bad happens to your iPhone 7(plus). We have explained how you can transfer contacts from iPhone 7(plus) to the computer. Read through to know how to do it. You can transfer contacts from iPhone 7(plus) to the computer using iMyfone D-Back iPhone data extractor for Win or iPhone data extractor for Mac. iMyfone D-Back supports Mac and Windows OS and can, therefore, extract contacts and save them on your Mac or Windows PC. 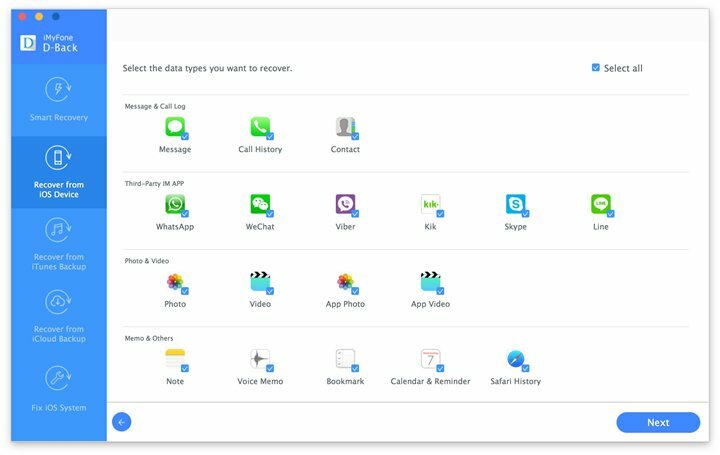 It supports various data types such as reminder, text message, contacts, WhatsApp attachment, notes, Voice Memo, audio, videos, iMessage and others. 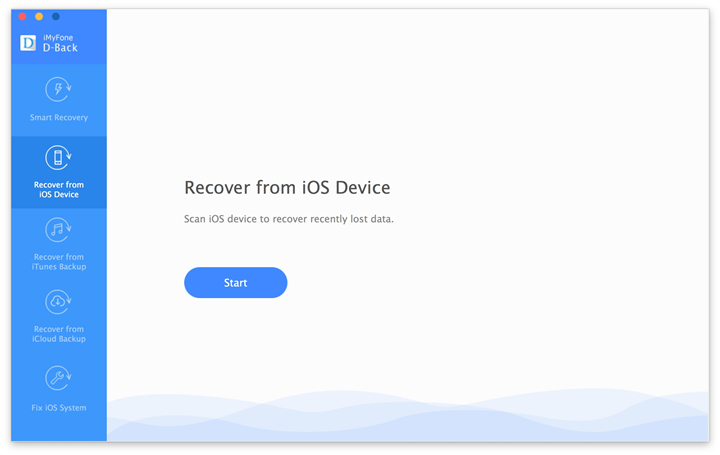 It extracts or recovers data with four ways; Smart Recovery, Recover from your iOS device, Recover from iTunes backup, and Recover from iCloud Backup. It has a fix iOS to normal feature can fix the iOS system when it is on a black screen, apple white logo or recovery mode. It supports preview of files before extracting them. It supports iOS devices like iPhone 7, iPhone 6s, iPhone 6s plus, iPhone 6, iPhone 6 plus, iPhone 5, iPhone 5c, iPhone 5s, iPhone 4 among others. With iMyfone D-Back iPhone data extractor, you can transfer contacts from iPhone 7(plus) to your computer. It takes few steps to complete transferring the contacts to computer. Using the following guide, you should be able to easily transfer contacts from your iPhone 7(plus) to your computer. Ensure iMyfone D-Back program is running on your computer. On the program, select ‘Recover from iOS device’ option. Click the ‘Start’ button. Once you have fixed your iPhone device to the computer, select the contacts files that you need to transfer. After your device has been detected by the program, tap the ‘Scan’ button. After scanning is over, the program shows all the files that you can extract from your iPhone 7(plus). 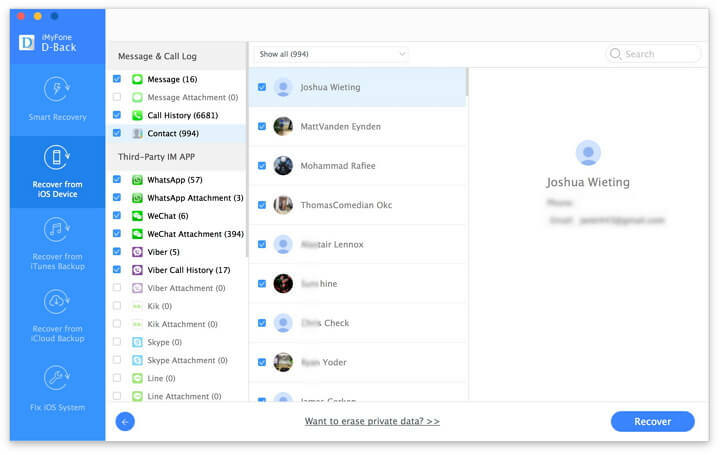 Preview the files to identify the contacts you want to extract. Select the contacts and hit the “Recover” button to save the contacts on your computer. iMyfone D-Back iPhone data extractor for Win or iPhone data extractor for Mac makes it simple to extract and transfer contacts from iPhone 7(plus) contacts to computer.